While a tornado devastated parts of Western and Central Massachusetts last night, Boston was surviving, and in some cases enjoying, a thunderstorm. 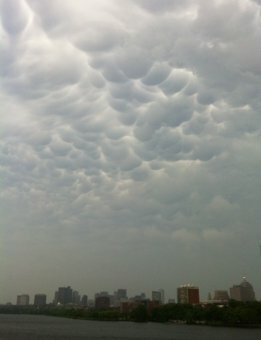 When I left MIT at about 7:00 p.m., the clouds over Mass Ave. looked strange. When I got to my apartment in Jamaica Plain at 8:00, the air was wet. After eating an ice cream sandwich for dinner and taking a shower, I noticed that the neighbors were throwing a rowdy birthday party. The storm hit just after they sang Happy Birthday. I thought the storm had shut their party down, but I was wrong. The downpour was so loud, it drowned them out. As the rain tapered off, I could hear their music filtering through the storm. I thought the storm might subdue my neighbors into a different soundtrack — maybe Billie Holiday or opera. No such luck. They went back to their usual: an instrumental that sounds like a disco remix of Super Mario Brothers III. Today it’s so calm and sunny, the whole thing seems like it might not have happened. Post and recording by Alexa Mills. Beautiful recording! It’s just as you described it, and a real pleasure to hear. Wow, this is really pretty to listen to, but when I was hearing it from my apartment, I was so scared! I could do a whole series on the strange sounds coming out of my neighbor’s house. With this one, they even defied nature.